"Start this recipe at least a day and up to a week before you want to serve it. Garnish with a wheel of lime and a basil leaf if you wish." Pour rose wine into ice cube trays. Freeze until solid, 8 hours to overnight. Line a baking sheet with parchment paper. Spread out watermelon cubes so they are not touching. Freeze until firm, at least 2 hours. Transfer to a resealable plastic bag. Return to the freezer. Combine water and sugar in a small saucepan over medium heat. Stir constantly until sugar dissolves, 2 to 3 minutes. Add basil; bring to a boil. Remove from heat and let steep for 15 minutes. Strain simple syrup into a jar with a lid. Discard basil leaves. Place in the refrigerator. 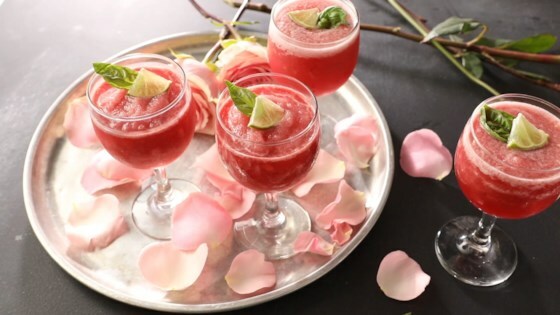 Place rose ice cubes, frozen watermelon, chilled simple syrup, and lime juice in a large blender; blend until combined and smooth. Pour into glasses. Juicy, refreshing and easy to make! This recipe works best with darker rose wines, such as Pinot Noir or Merlot varieties.